What is it? 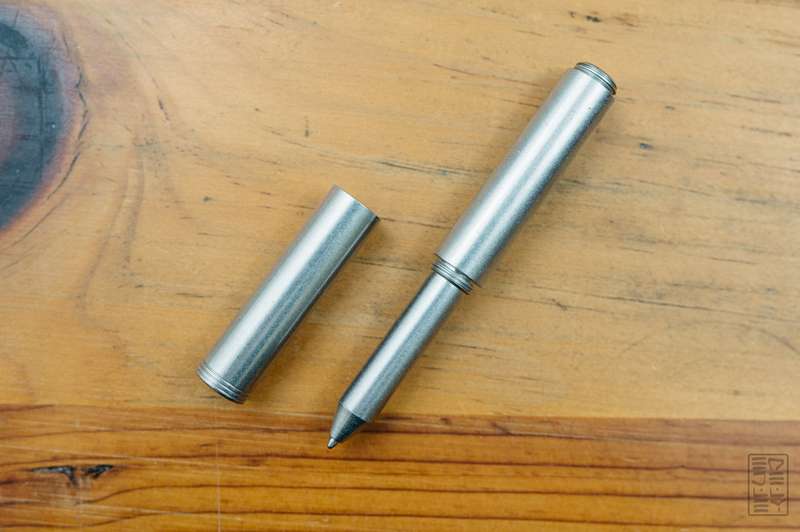 A stainless steel pocket pen with a brass set screw, all made right here in the USA. Notes: It seems to be the summer of the media blitz. It’s cool to see manufacturers and makers reaching out to blogs for coverage. I personally enjoy seeing what other reviewers think about the same products. 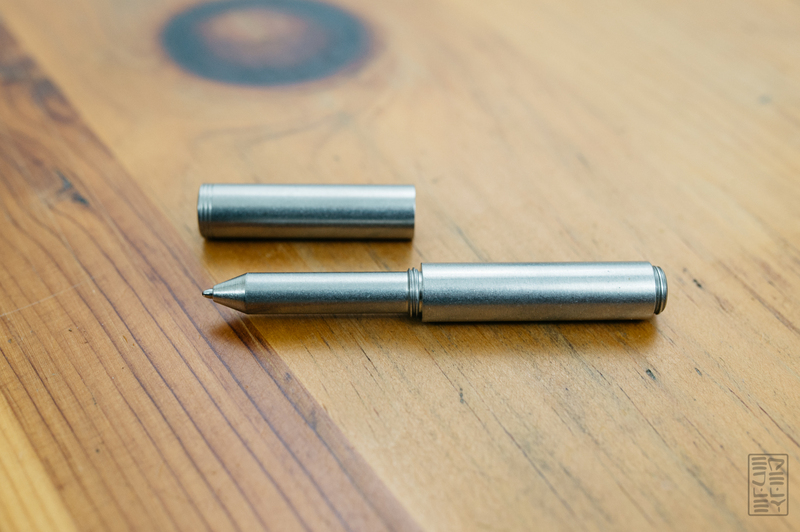 One of the pens that’s making the rounds is The Pen Project 01S in Tumbled Stainless Steel by Schon DSGN. 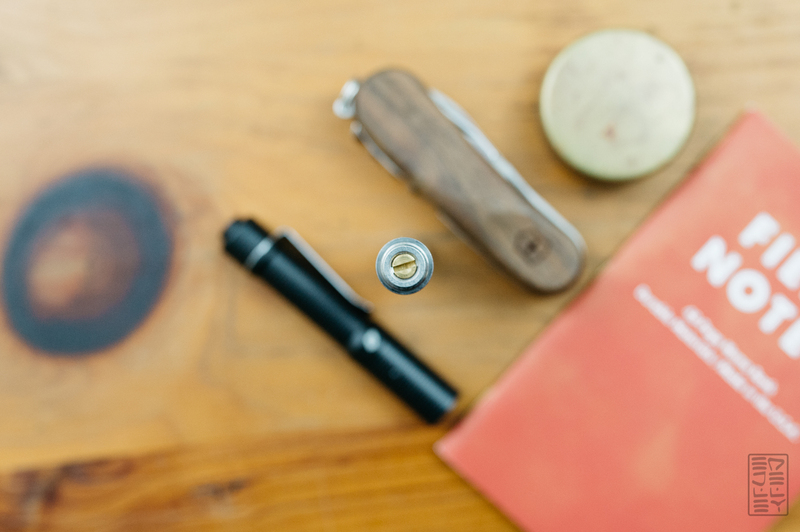 It’s a small, pocketable pen that takes the versatile and tough Fisher Space Pen refill. Ian Schon’s pens are available in several different materials, including aluminum, titanium, bronze and brass. Stainless Steel is one of the strongest and heaviest in the lineup. Read on to see how I liked it! The pen is really well made. The tolerances are tight, the tumbling is smooth, and it just feels solid – especially because it’s made of stainless steel. The 01S is 1/2″ in diameter, 4″ when closed, and 5 3/4″ when posted. The pen weighs a hefty 2.9oz, which is by no means light. There’s a brass set screw in the back that releases the refill, and a few subtle lines machined into the cap for some visual flair. 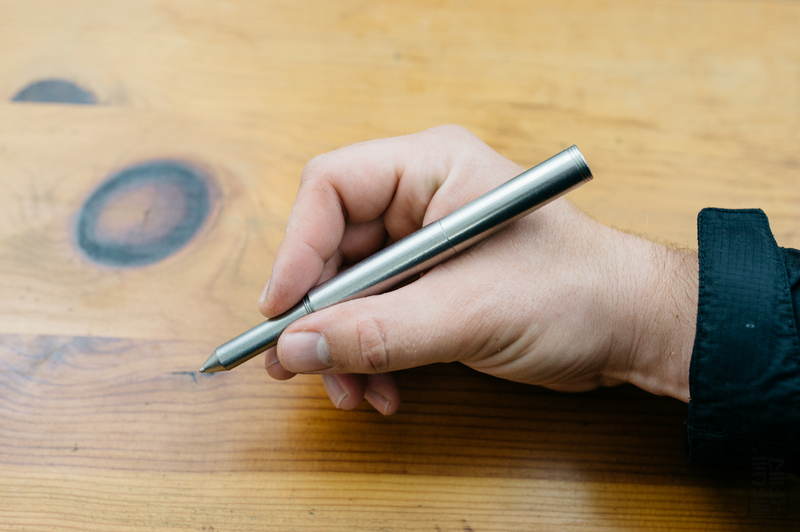 The pen looks like a tool, feels like a tool, and well…it is a tool. This pen is definitely utility-driven and I have no doubt it will outlast nearly everything I own. The pen comes packaged snugly in a cardboard tube (which I may have lost before taking photos) and is nicely presented without being wasteful. In hand, the pen is a comfortable length, but the heavy material makes it feel pretty heavily balanced towards the back. The grip section is straight and smooth, I haven’t found it hard to grip or slippery – probably due to the tumbled finish providing a bit of texture. 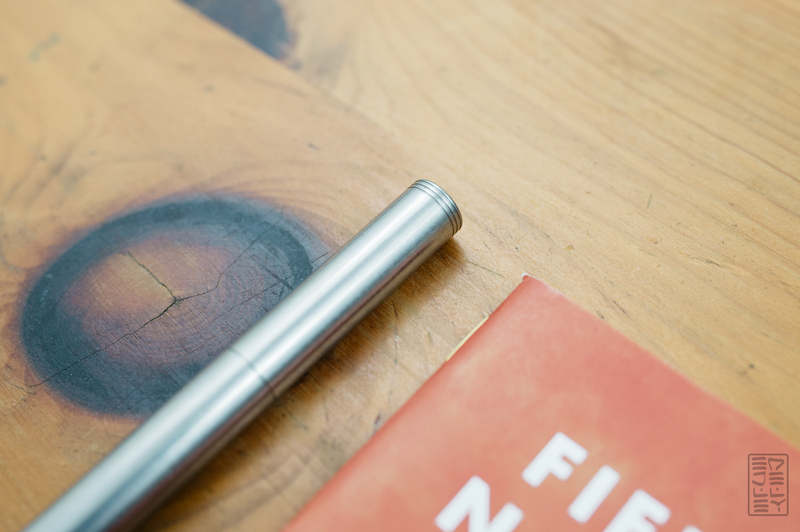 The pen’s point comes to a conical tip which makes it easy to see what you’re writing down. The threading stays out of the way of your grip too. The bottom of the pen has a brass set screw that you can open up with a screwdriver or even a dime. It keeps the Fisher Space Pen refill snugly inside and ready to write. The refill writes like a typical ballpoint pen, and looks like one too. The difference is that the cartridge is pressurized, allowing you to write on dirty, dusty, wet paper. You can write in the rain, you can write in space, but let’s be real – you’ll probably just be jotting down quick notes. That’s what this pen is ideal for. The refill definitely gets the job done for everyday writing tasks. There are things I like about the pen, and some that I don’t. While the form factor is great for EDC, the weight of the stainless is just a bit too much for my taste. It’s fairly noticeable when you’re carrying the pen in pocket, and even more so when using it. Would I recommend the pen? Yes, but definitely the anodized aluminum or the titanium version. Huge thanks to Ian for sending the pen over for review, it’s a great mesh of design and engineering! You can pick up a pen from Schon DSGN here. 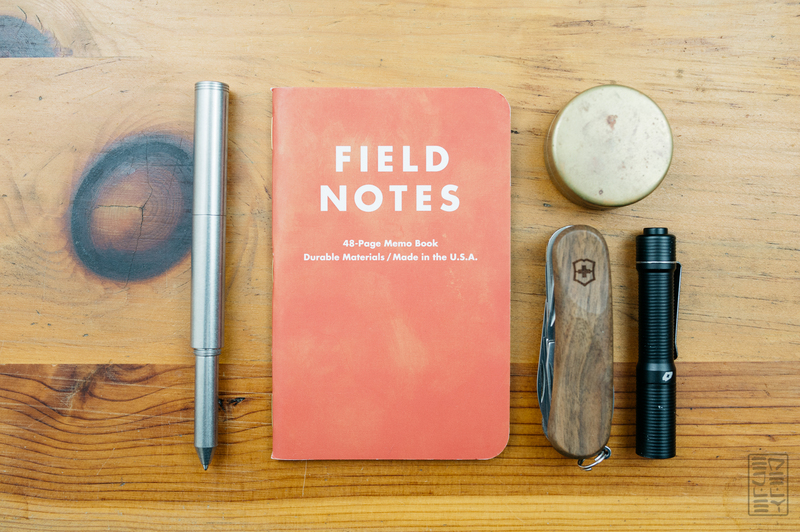 i’m liking that swiss army wooden pocket knife.